The congregation of St. Peter and St. Paul Ukrainian Orthodox Church was founded in 1939. The names listed on the title of the Church as trustees of the Church were Adolph Anton Bordun, Nykola Eliuk, and Fedor Olynyk. Most of the members of the congregation came from the Bukovyna and Haluchyna regions of the Ukraine during the first wave of immigration to Canada from Ukraine between 1891 and 1914. Many of these pioneers first settled in Arbakka where they were granted tracts of land. After the railroad was built and Sundown began to be settled, some of these early pioneers relocated to Sundown in the 1930s and subsequently established the Church, National Home, and Cemetery. The first church service was conducted in 1939 by Reverend Father Ivan Dmytriw in the original hall – the Ukrainian National Home. Subsequent services were conducted by Reverend Fathers Luka Berezitsky, E. Ulian, Petro Glitsky, Ivan Hykawy, and Serhiy Gerus. The land for the Church was donated by John Eliuk. 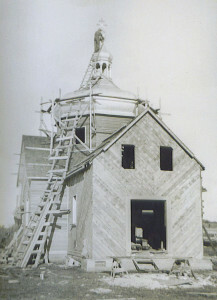 Construction began in 1940, the date being recorded on a cornerstone of the Church. The first service held in the Church was in 1941. The Church was blessed in 1944 by Archbishop Ivan Teodorovich. Nykola Eliuk, Theodore Werenko, and Adolph Bordun formed the first executive. The interior of the Church was painted by iconographer John Pushka in 1954. Records show two payments for painting of the Church – $300 and $500. St. Peter and St. Paul Ukrainian Orthodox Church of Sundown was designated Manitoba Municipal Heritage Site No. 341 by the Rural Municipality of Stuartburn on April 7, 2009. For more information, visit the Province of Manitoba’s historical sites webpage here.